Tamara Piilola’s big landscape paintings feeding our imagination fill Korjaamo Galleria’s big exhibition space. The artist is interested by difficult equations and tries to find by painting solutions to subjects, which might at first seem impossible to visualize. Colour and light are in the center of the figurative paintings. According to the artist, the starting points of the paintings lie whereas the ideas. The artist sketches and photographs pictures to an image bank, from where she collects the most interesting savings for parts of her paintings. The richness of the enviroment and the flow of images that the nature provides in all its greenery inspire the artist. The real overlaps with the unreal and the most interesting part of the paintings originates from the imagination of the artist. When looking more carefully, the paintings form also for the viewer a gate to an intriguing fantasy world. The verticality of the trees cut the horisontality of the landscape. The trees are trying to attain something that the viewers’ sight is unable to reach. The trees stretch in two directions, up to the sky and down under the ground, when enlargening their perspectives and trying to achieve a yet unknown, new reality. What kind of world is the one like, towards which the ever-stretching trees are leading us? Light is playing the main role in the paintings. The viewers sight turns easily inside up when watching the paintings filled with details. One shape turns into another and the amount of meanings increases in parallel with the limits of our conceptualization. The fact that things might turn up and down or a suspicion of another possibility or interpretation leads closer towards what it is all about. 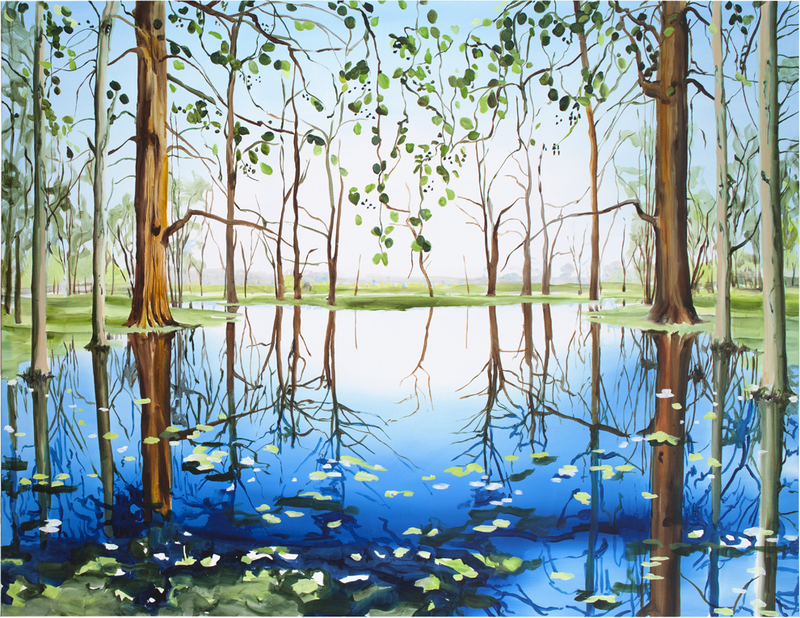 The serene and calm paintings hide in themselves exhiting, even threatening turnups, where the centrally positioned trees come to life. Tamara Piilola (b. 1977) has studied painting at the Turku University of Applied Science, at the Helsinki Art Academy and the Leipzig Hochchule für Buchkunst. Her works have lately be seen for example at Kunsthalle Helsinki. Piilola’s works are among others part of the Jenny and Antti Wihuri foundation, Sara Hildén Art Museum, Helsinki City Art Museum and Wäinö Aaltonen Art Museum collections. Tamara Piilola lives and works in Helsinki.